I enjoyed learning to drive. I did, that is, until the driving instructor asked me to do a three-point turn in the middle of the road. That was a different matter. Nonetheless, it was an important skill to learn. I’ve lost count of the number of times I’ve set off in my car only to realise that I’m going in completely the wrong direction. No problem! I can simply do a U-turn and head back the right way. To repent involves doing a U-turn with my life. By nature we all live ‘my way’, the way that pleases me, ignoring God and doing as I want. I’m living my way when I’m in charge of my life. Jesus came to show us that living ‘my way’ means heading in completely the wrong direction. It means heading for judgement and death, and missing out on heaven. To repent means turning around and going in the opposite direction. It means living God’s way, with Jesus in charge of my life and trusting in him as my Lord and Saviour. It means receiving mercy and life, and looking forward to enjoying eternity in heaven. When we understand who Jesus is and why he came it can quite literally turn our lives around. When I was a boy a power cut was a major source of excitement. Nowadays we all have torch lights built into our mobile phones. But in those days I remember scurrying round the house helping dad to find the candles and matches that were ‘somewhere’. It went something like this: ‘Watch out!’ ‘Ouch!’ ‘What’s that?’ as we stumbled from room to room, stubbing our toes and banging into things. We need light to be able to see and to find our way. And that’s why we need Jesus. You and I cannot see God unless he shows himself to us. And we cannot find the way to heaven unless he shows us the way. 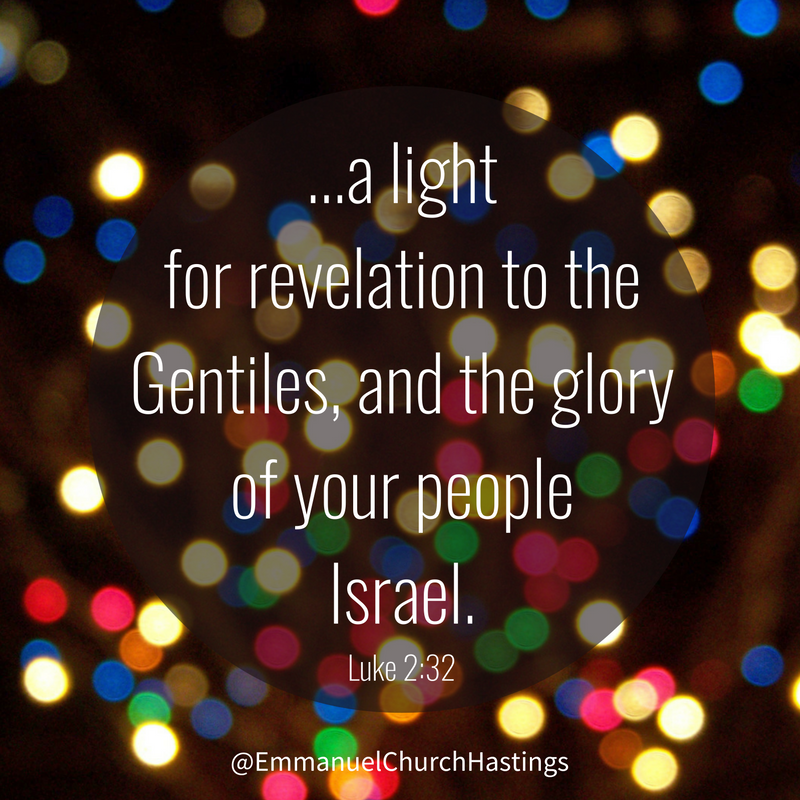 But the good news of Christmas is that God has not left us stumbling around in the dark. He has made himself known to us by becoming one of us. And he has opened the way to heaven for all who believe. The way is not a set of rules. It’s not a moral code or a set of religious rituals. It’s a person. It is Jesus Christ. That’s why Christmas is such wonderful news! When was the last time that you couldn’t stop singing someone’s praises? Perhaps it was a footballer who scored a stunner from 25 yards out. Or perhaps it was after seeing your son or daughter performing in the school orchestra. Or perhaps it was when someone did far more than you expected to help you out of a tricky situation. 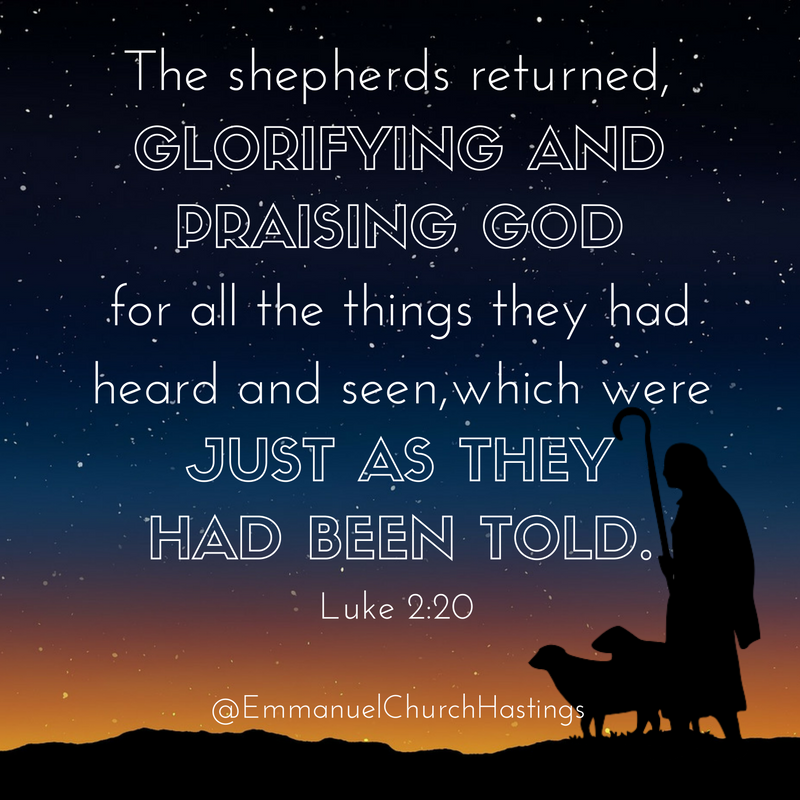 When a company of angels appeared to some shepherds and told them that a baby had been born who was going to be their Saviour and King it must have sounded like a tall story. But the angels gave the shepherds a sign to prove that it was true: the baby would be found in an animals’ feeding trough, wrapped in cloths. I guess the shepherds could have just shrugged their shoulders and said they weren’t interested. They could have said they’ll look into it another time when they weren’t so busy. They could have laughed it off as nonsense. But they didn’t. They hurried off to see for themselves whether it could be true. 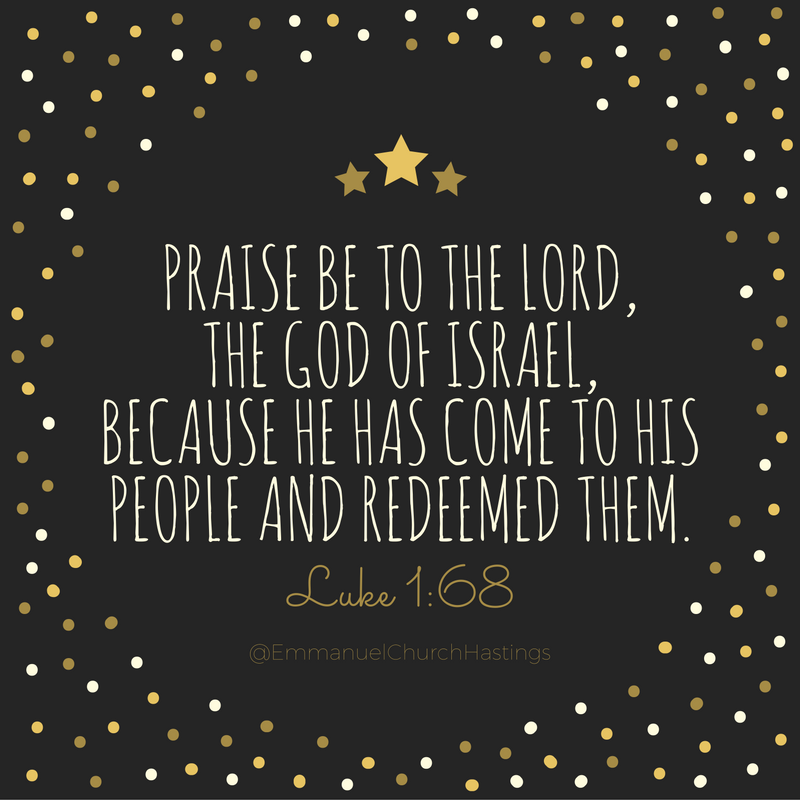 And they returned singing God’s praises because everything was just as they had been told. Perhaps the good news about Jesus sounds like a tall story to you. But the question is whether you will do as the shepherds did and find out for yourself by reading about him in the Bible. If you do, you’ll find that it’s crammed full of signs that prove that the good news about him really is true. You might even find that you can’t stop singing his praises. Sometimes a boy might say of his girlfriend, ‘I worship the ground she walks on. I’d do anything for her; she just needs to say the word.’ He’s saying how highly he values her. What do you place the highest value on in your life? We all worship someone or something. It’s whatever we treasure most. If it’s true that Jesus is our Creator God who has come in the flesh, then our right response is to worship him. To put it another way, our right response is to show his infinitely great worth by listening to him, trusting him, and doing his will in every area of life. Then you haven’t yet understood what awesomely good news his birth is. When we read about Jesus in the Bible we find ourselves reading about a man of breath-taking kindness and compassion, who did things with jaw-dropping power and authority, who amazed everyone who saw him or listened to him, who smashed death to pieces by dying on a cross and rising again to new life. There never has been, and never will be, anyone else like him. He is unique. And he didn’t come to be a killjoy. He didn’t come to squash all the fun out of life. He came so that you and I might have life and have it to the full; life in all its abundance, full of joy and hope and blessing. Worshipping him with our lives, that is, listening to him, trusting him, and living the way he shows us, is far from dull. It’s the most exciting way to live! “Nothing lasts forever!” I wonder how many times you’ve heard someone say that! Perhaps you’ve said it yourself. I know I have. And on the face of it, it seems to be true. In fact, I’m reminded of it every time I pull something tasty out of the fridge only to find that it’s gone past its ‘use by’ date. And it’s not just food. Holidays come to an end. Clothes wear out. Cars break down. Banks go bust. Hair turns grey! It seems that nothing does last forever. But the great news is that there is something that will last forever. 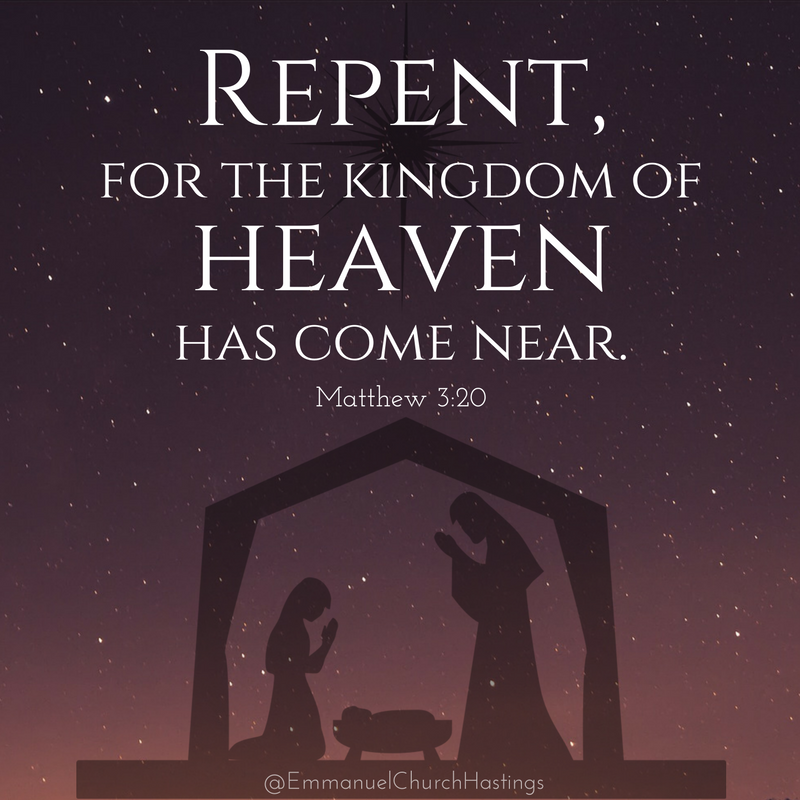 When Jesus was born, God announced, ‘his kingdom will never end.’ Jesus’ kingdom isn’t a place, it’s people. It’s the community of people who live under his good and loving rule, and enjoy God’s blessing through trusting him and obeying him. And this community, the Bible says, will last forever. That is, it’s a community of people who have life that will last forever; eternal, never-ending, everlasting life. The great news is that you and I can be part of that community and start living that life today! Politicians and world leaders don’t always get the best of press. In recent weeks, crowds of people have taken to the streets in America to protest against the election of Donald Trump to the White House. In other parts of the world, leaders and their governments are often described using words such as ‘dictatorship’, ‘suppression’, ‘exploitation’, ‘corruption’, ‘injustice’ and so on. With Jesus it’s altogether different. He rules over a kingdom. But it’s not a worldly kingdom. You won’t find it on a map. It doesn’t have geographical boundaries. You can’t get into it by flashing a passport. 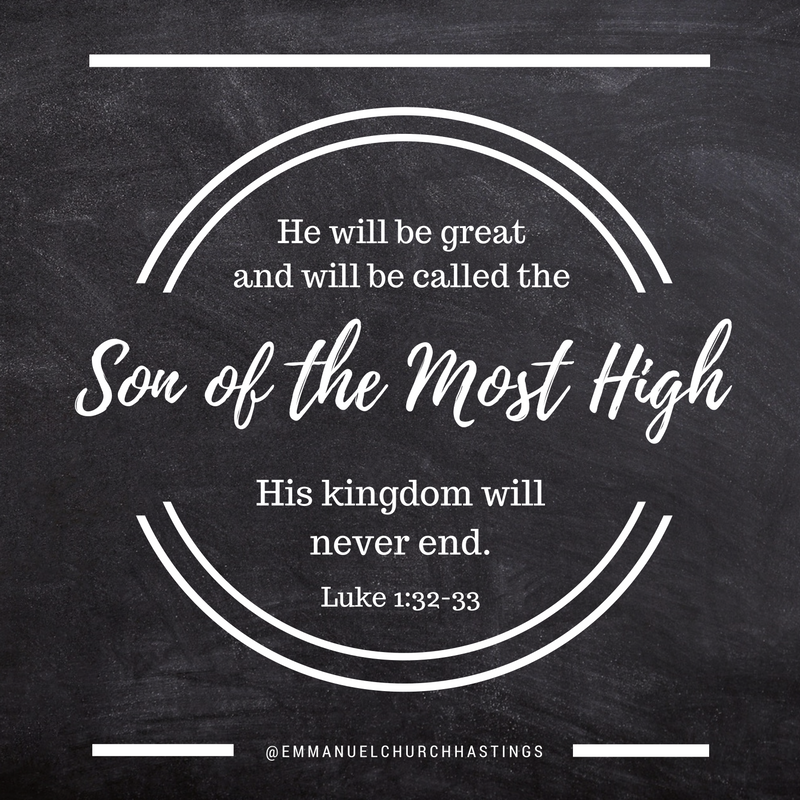 His kingdom is made up of men, women and children who trust him and obey him as their Saviour and King. And the words that are associated with his kingdom are lovely: ‘justice’, ‘righteousness’, ‘freedom’, ‘joy’ and ‘peace’, to name just a few. This baby, born on that first Christmas Day, is the king we’ve all been waiting for. He rules with love and mercy and stands against all that is evil. He leads all who listen to him in paths of life and blessing. And he invites all people everywhere to come to him and take their place in the most wonderful kingdom the world has ever known. Who would you least like to make an enemy of? Your boss? The Headmaster? Your landlord? The Bank Manager? Your mother-in-law? The bad news is that we’ve already made an enemy of the most powerful being in the universe: the God who created it all. He created us to live in fellowship with him: to know him and love him and enjoy him forever. But when we ignore him and live our lives without reference to him he is rightly angry with us. We make an enemy of him and bring ourselves under his judgement. But God loves us so much that he sent his one and only Son into the world to end the hostility between us. 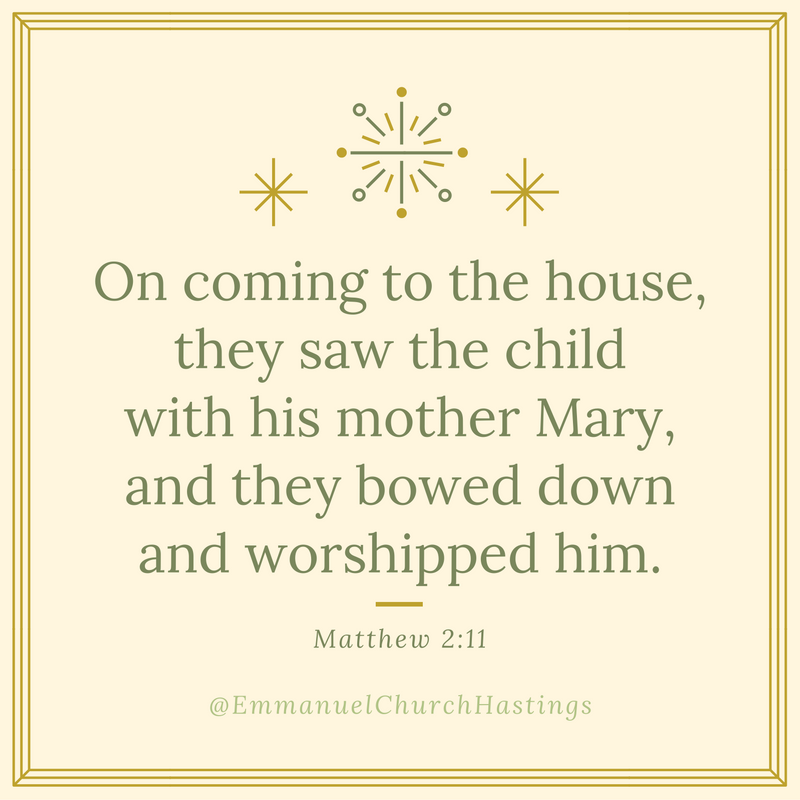 This baby, born on that first Christmas day, came to reconcile us to the God who made us. 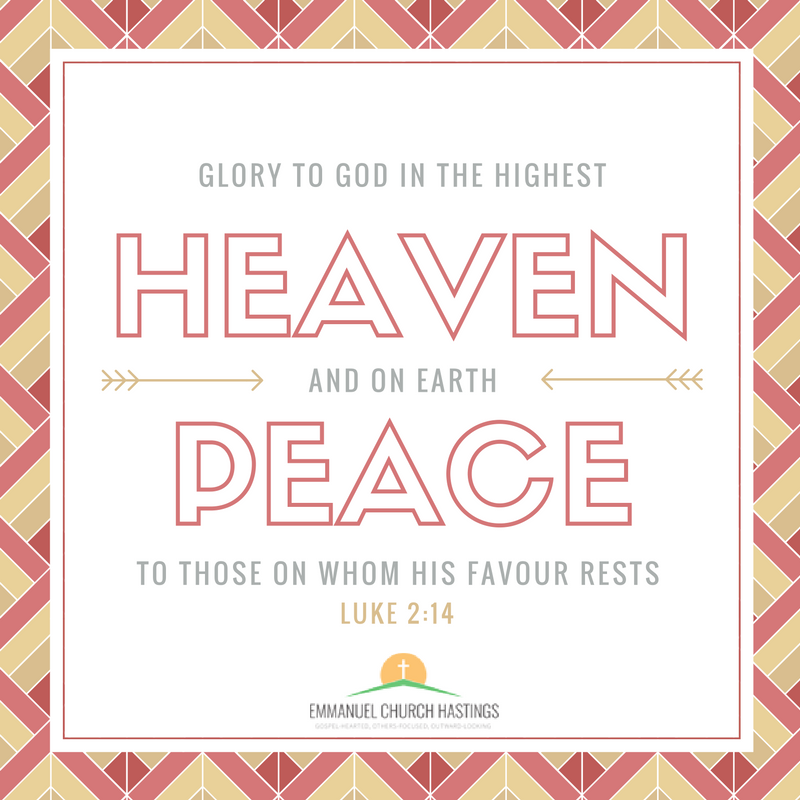 He came into the world to bring us peace with God and to make it possible for us to know him as our heavenly Father and friend. And the great news is that we don’t need to wait. We can enjoy a new relationship with him today. That’s what redemption means, it means buying back something that’s in someone else’s possession. You and I are in someone else’s possession. We are held captive by death. Death is the penalty for our sin. Of course, we don’t like to talk about it. And we do all we can to fight against it. But death is all around us. Our friends and loved ones die. Pets die. The flowers in our gardens die. We don’t like to think about it too much because it quickly gets too depressing. But we don’t need to feel that way because Jesus came to redeem us from death’s grasp on us. Because he loves us so much, he came to buy us back from death’s hold over us and give us life: real, wonderful, joy-filled life. It’s God’s gift to us. And we can receive it by putting our trust in this little baby who was born on that first Christmas Day. What’s in a name? Sometimes, quite a lot. If you come across a man who’s known to his friends as “psycho” you know to take care. 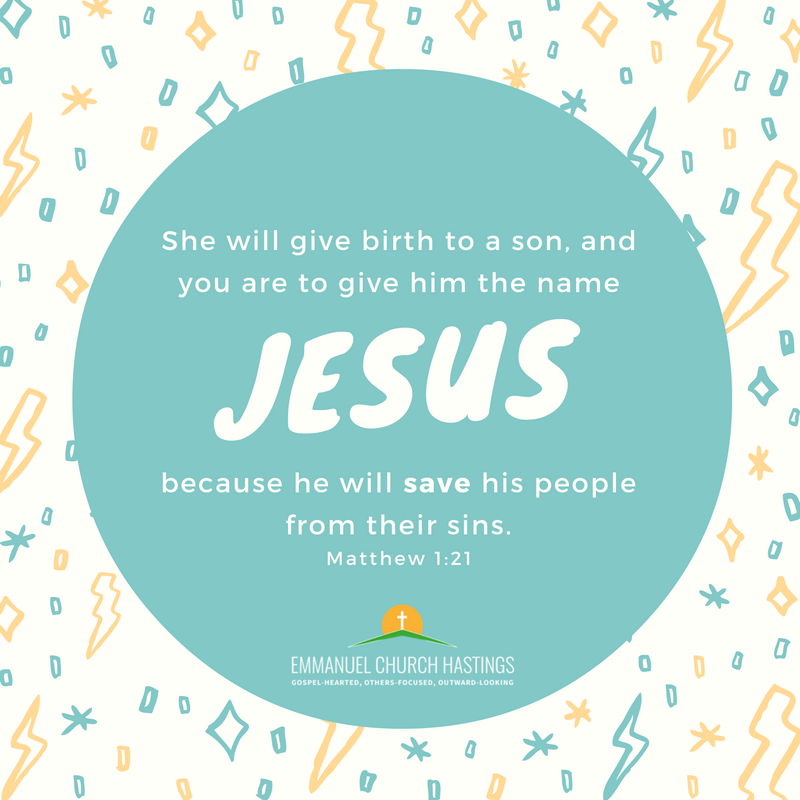 Jesus has an altogether different name. It means “he saves”. But what does he save from? As you read this I imagine you’re feeling reasonably relaxed. Perhaps you’re sitting on the sofa with a cup of tea in your hand, or perhaps in a coffee bar in town eating a slice of chocolate fudge cake. You probably don’t feel as though you’re in great danger. But although we may not realise it, the Bible says that we’re all in danger. And that’s because of the way we treat God. We quite like the idea that he exists, perhaps. But if we’re honest, most of the time we ignore him. We get on with living our lives however we please. We don’t listen to him. And we value him little. It’s what the Bible calls sin. It brings us under God’s condemnation and it has eternal consequences. It will cause you and me to miss out on heaven. 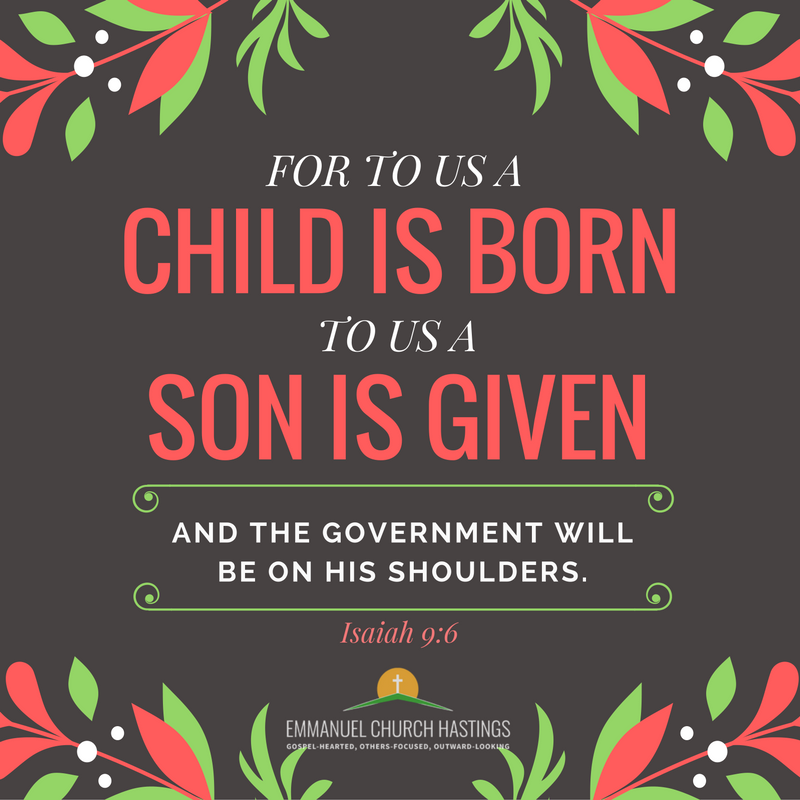 But the great news of Christmas is that Jesus has came to save us from the consequences of our sin. As a man, he willingly bore God’s anger at sin in our place so that we will never have to. Because of him, you and I can be forgiven. This baby, who was born on that first Christmas Day, can deal with our sin and get us into heaven after all! What was the last time you heard some really good news? Perhaps it was the birth of a grandchild, or a promotion at work, or the announcement that a friend had got engaged. And what do you want to do when you hear good news? Most of us want to share it. If it’s really good news we want to shout it from the rooftops so that everyone gets to know about it. The news about Jesus is like that. 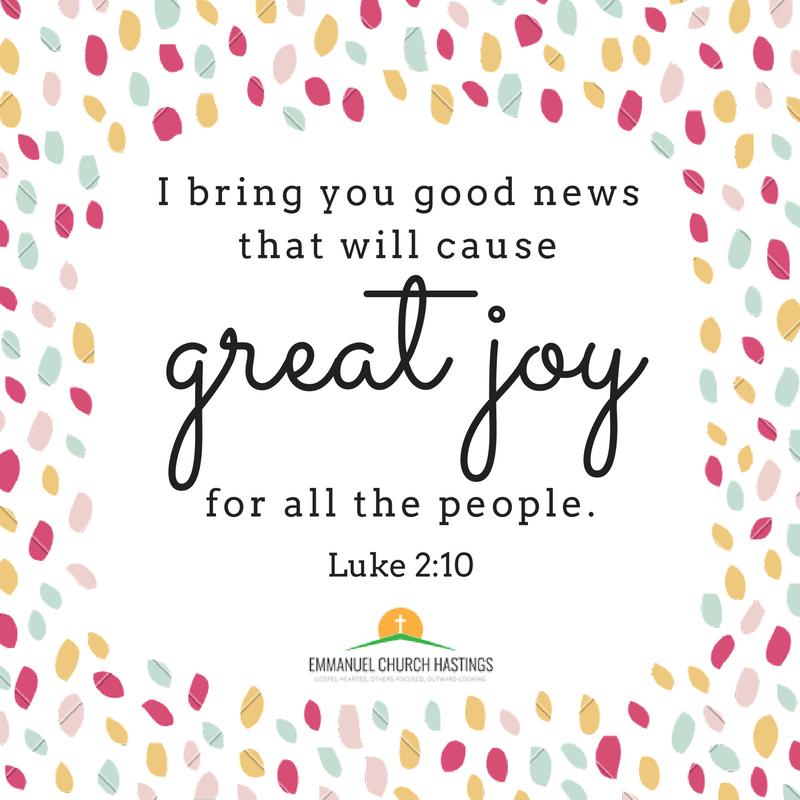 It isn’t just good news, it’s great news! It’s the kind of news that people can’t keep to themselves. They want to talk about it with anyone who will listen. Why? Because it’s cause for great joy. It’s guaranteed to put a spring in your step if you’ve understood it properly. And this news is for all people everywhere. No-one is excluded. It’s for everyone… absolutely everyone. It doesn’t matter how old you are, or how you got on at school, or whether you work or not, or what colour your skin is. This news is for everyone. And that includes you and me! That’s why Christmas is a celebration. Jesus' triumphal entry into Jerusalem (Matthew 21:1-11) by Nigel Harvey. The call of Gideon (Judges 6:1-40) by Jamie Coussens. Husbands and Wives (Ephesians 5:25-29) by Nick McQuaker. News Spreads (Matthew 4:23-25) by Martin Lane. Disordered desires (Romans 1:18-27) by Nick McQuaker.